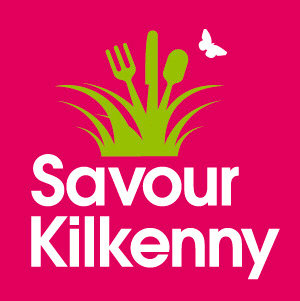 Tweets and trends, coffee and conversation, information and inspiration: all in the mix at Savour Kilkenny‘s first Irish FoodCamp last Friday. It was a full on day. Not only were Dinner du Jour and I presenting a new Irish blogger resource but the schedule was crammed with talks on a variety of food-related topics. I love experimenting with and learning different cooking techniques, especially if they involve playing with yeast. No Knead Bread? Yes please! Artisan Bread in Five Minutes a Day. Made that. Sourdough from my own starter? Still bubbling quietly away in the fridge. But grilled or barbequed pizza? Not yet – that was until I got my hands on a copy of Craig Priebe’s Grilled Pizzas & Piadinas. Craig developed his grilling technique, using a barbeque, when he ran his own pizza restaurant in Atlanta and this book explains it in detail. When we did the pizza day in Ballymaloe, Darina cooked one of her creations on the barbeque outside the demo theatre door but, more fascinated by the wood-fired oven, I didn’t hang around in the rain, instead directing my attentions indoors so I never got to investigate the barbequed pizza properly. Although there has been lots of salad planted in the garden on recent weekends, including mustard greens, rocket and mizuna (at least I’ll be able to distinguish between the plants after cramming in Ballymaloe for the salad leaves and herbs exams! ), it’s going to be a while before any of the leaves are big enough to eat. Then, of course, because our planting in succession routine is not entirely developed – despite best intentions – we’ll have another glut to work through. But that’s all ahead of us and, until then, I’ve been growing my own salad on the windowsill. Lacking my once-easy access to a variety of shops, providing me with a large assortment of ingredients to play with, these days I tend to concentrate on the products available in Urru and have also become a habitué of my local health food shops. After finding some cacao nibs in The Granary (Mallow) and picking up a bag of buckwheat flour from Horan’s Health Store in Fermoy, I decided to make a batch of Alice Medrich‘s Nibby Buckwheat Butter Cookies that had come to my attention through 101 Cookbooks. Always read the recipe before starting, always read the recipe. That’s an instruction that’s been drummed into me for years, whether in Home Ec class, while studying in Ballymaloe, or just from experience on many occasions of getting half-way through baking something only to discover that an essential item was missing. Slow Food Cork has an event coming up this Thursday, 17 April, at a new bar called An Crúibín on Union Quay. Before it was revamped and made over, the venue was known as the Lobby Bar, site of many a night of musical madness and commemorated by inimitable Cork musician John Spillane in the nostalgic Magic Nights in the Lobby Bar. Now a tapas bar, An Crúibín will play host to, we are promised, a traditional evening of pigs trotters, tails, ribs and cheek, accompanied by bread from the Arbutus Bakery and pints of Beamish, my stout of choice. The event starts at 8pm, it costs €10 for Slow Food members (€15 for non-members) and bookings can be made at 021 4505819. There’s a video report on the first Mallow Farmers’ Market on TG4 – go to Cúrsaí Reatha – Cartlann, scroll down to Nuacht TG4 – 05/04/08 and the piece is third on the Nuacht, 6.38 into the clip.